While turf wars may play a part, the debate about Enterprise and Systems governance is rooted in a more serious argument, namely, how the divide between enterprise and systems architectures may affect decision-making. The answer to that question can be boiled down to four guidelines respectively for capabilities, functionalities, visibility, and uncertainty. Authority: deciding how to perform processes and make commitments in the name of the enterprise. That can only be done by human agents, individually or collectively. 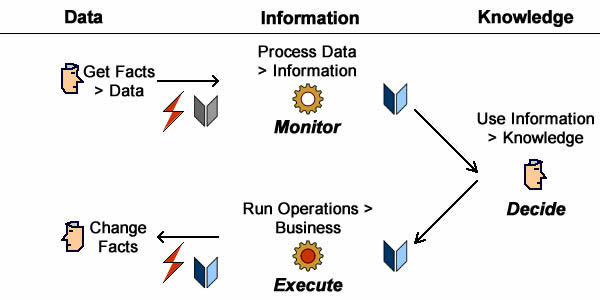 Execution: processing physical or symbolic flows between the enterprise and its context. Any of those can be done by human agents, individually or collectively, or devices and software systems subject to compatibility qualifications. Control: recording and checking the actual effects of processes execution. Any of those can be done by human agents, individually or collectively, some by software systems subject to qualifications, and none by devices. Platforms and technology affects operational concerns, i.e physical accesses to systems and the where and when of processes execution. Enterprise organization determines the way business is conducted: who is authorized to what (business objects), and how (business logic). System functionalities sets the part played by systems in support of business processes. Guideline #1 (capabilities): Objectives and roles must be set at enterprise level, technical constraints about deployment and access must be defined at platform level, and functional architecture must be designed as to get the maximum of the former subject to the latter’s constraints. At its core, enterprise governance is about decision-making and on that basis the purpose of systems is to feed processes with the relevant information so that agents can be put it to use as knowledge. Information processing begins with data, which is no more than registered facts: texts, numbers, sounds, visuals, etc. Those facts are collected by systems through the execution of business, engineering, and servicing processes; they reflect the state of business contexts, enterprise, and platforms. Data becomes information when comprehensively and consistently anchored to identified constituents (objects, activities, events,…) of contexts, organization, and resources. Information becomes knowledge when put to use by agents with regard to their purpose: business, engineering, services. Along that perspective, capabilities can be further refined with regard to decision-making. 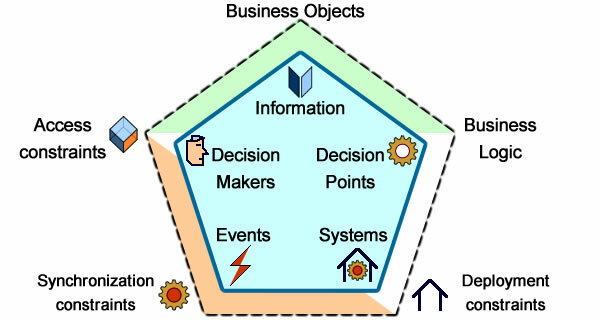 Starting with business logic one should factor out decision points and associated information. 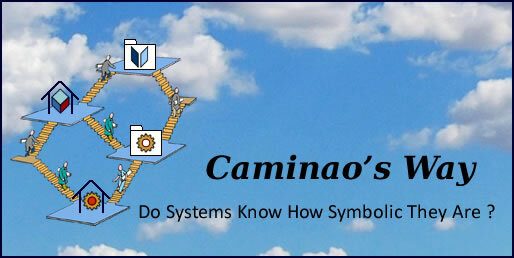 That will determine the structure of symbolic representations and functional units. Then, one may derive decision-making roles, together with implicit authorizations and access constraints. That will determine the structure of I/O flows and the logic of interactions. Finally, the functional architecture will have to take into account synchronization and deployment constraints on events notification to and from processes. Guidelines #2 (functionalities): With regard to enterprise governance, the role of systems is to collect data and process it into information organized along enterprise concerns and objectives, enabling decision makers to select and pull relevant information and translate it into knowledge. Contexts are set by architecture layers: enterprise organization, system functionalities, platforms technology. Concerns are best identified through processes: business, engineering, or supporting services. Actually, decisions scopes overlap and their outcomes are interwoven. Assets: shared decisions whose outcome bears upon several business domains and cycles. Those decisions may affect all architecture layers: enterprise (organization), systems (services), or platforms (purchased software packages). 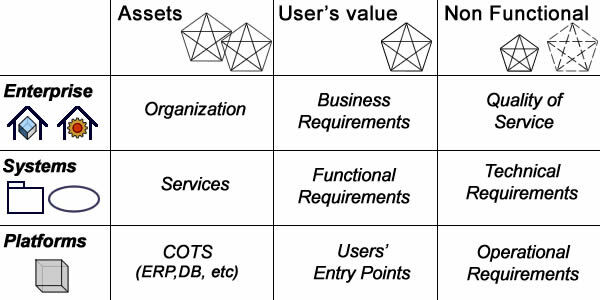 Users’ Value: streamlined decisions governed by well identified business units providing for straight dependencies from enterprise (business requirements), to systems (functional requirements) and platforms (users’ entry points). Non functional: shared decisions about scale and performances affecting users’ experience (organization), engineering (technical requirements), or resources (operational requirements). Functional requirements should be decided given business requirements and services architecture. Scalability (operational requirements) should be decided with regard to enterprise’s objectives and organization. Guideline #3 (visibility): Systems must feed processes with qualified information according to contexts (business, organization, platforms) and governance level (assets, user’s value, operations) of decision makers. Long secure behind organizational and technical fences, enterprises must now navigate through open digitized business environments and markets. For business processes it means a seamless integration with supporting applications; for corporate governance it means keeping track of risks and opportunities in changing business contexts while assessing the capability of organizations and systems to cope, adjust, and improve. On one hand risks and opportunities take root beyond the horizon and are not supposed to square with established information models; but on the other hand deep learning technologies is revolutionizing data analytics. purpose ontologies could be used to bring architectures and environments modeling into a common paradigm. Guideline #4 (uncertainty): assuming that business edge is built on unqualified information about risks or opportunities, explicit and implicit knowledge should be processed within shared conceptual frames; that can be achieved with ontologies.